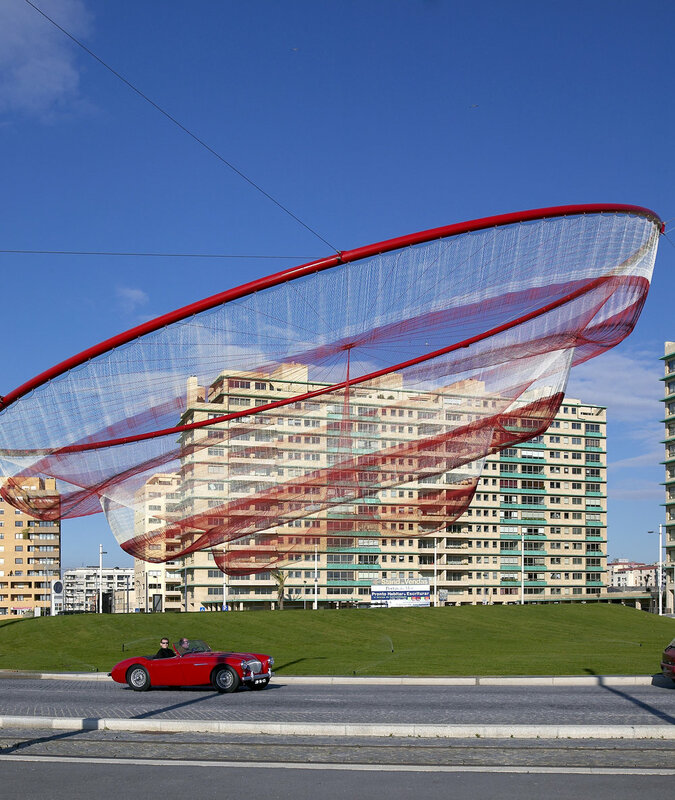 Using color and material to invoke the memory of the site’s history as a fishing and industrial center, this three-dimensional multi-layer net floats over the Cidade Salvador Plaza. 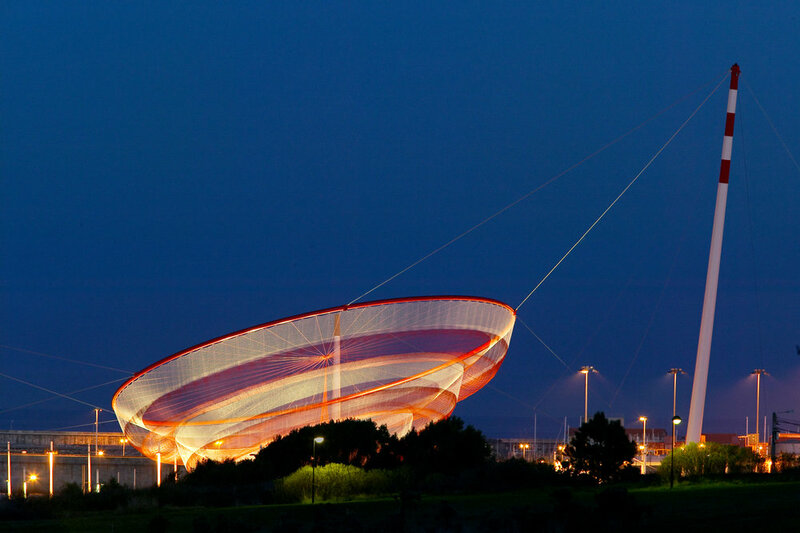 It is credited as the first permanent, monumental public sculpture to use an entirely soft and flexible set of membranes moving fluidly in wind. 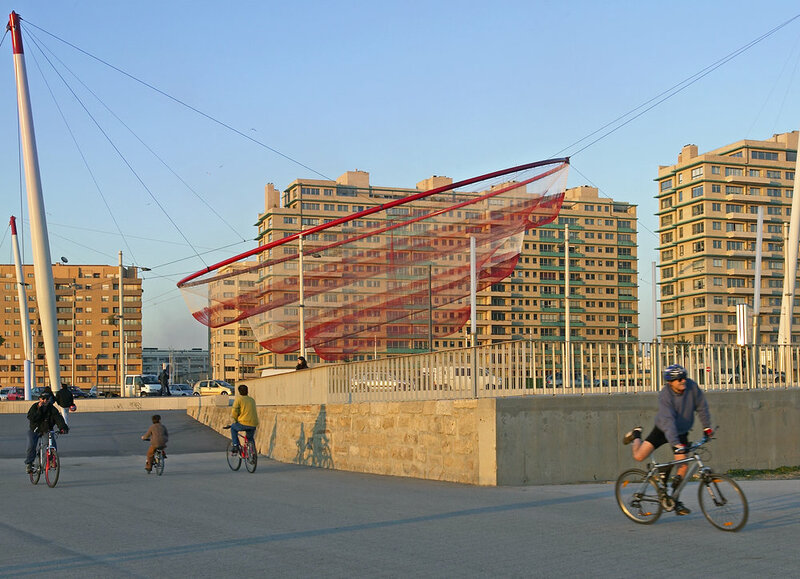 The work casts cinematic shadow drawings onto the ground, further highlighting the “wind choreography.” The city has made the sculpture its graphic symbol and residents give different interpretations of the work, from fishing nets, ships and masts of the Portuguese maritime history, the red-and-white striped smokestacks of the area’s industrial past, to Portuguese lace, sea creatures, and ripples in water. Three steel poles, ranging in height from 25 to 50 meters, are painted white with red stripes to reference nearby smokestacks and lighthouses. The poles support a 20 ton steel ring, from which the one-ton net is suspended. The ring greets the ocean at a slant, ranging from 13.5 meters off of the ground at the lowest point and 27 meters at the highest. The net is comprised of 36 individual mesh sections in different densities, hand-joined along all sides into a multi-layered form. The net material, TENARA® Architectural Fiber, is a 100% UV-resistant, colorfast fiber made of PTFE, the substance most widely known as the non-stick cooking surface Teflon®.